Goal scorer was none other than, veteran midfielder, Junior Michael, who shook off Kiwi defender, Martin Tamasese to fire the winning shot past Kiwi goalkeeper, Andrew Taylor. 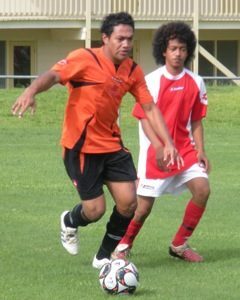 Michael’s 39th minute goal ensures that his team remain in second place as they take on Moaula United this weekend. Kiwi strikers weren’t at a loss for opportunities, but somehow managed to miss countless attempts at goal – shots were either too-high or too-wide. Moaula United still reign supreme over the Men’s Premier League, thanks to their whopping 21 goal difference and a default win over Strickland Brother’s Lepea. 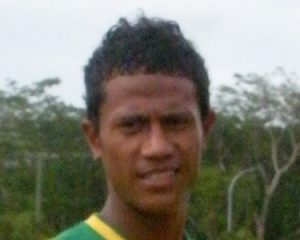 Vaivase-Tai proved that perserverence pays-off, in their match against Togafuafua Saints. After 45 minutes of play, Vaivase were trailing, 3-0. But Jerry Epa’s men fought back in the second spell to match Togafuafua’s trio with three unanswered goals of their own. In other matches, Adidas SC won, 3-1, over Goldstar Sogi FC. While Sogi have been struggling in recent weeks, Adidas are enjoying their new-found success with improved peformances in the early matches of round two. 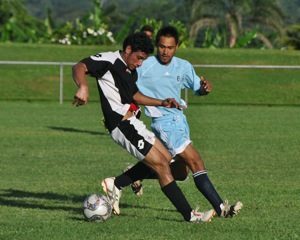 Silao Malo netted yet another hat-trick to claim a 3-1 win for Apia Youth in their encounter with Moataa SC. The 19year old has been aquiet achiever throughout the season, consistently producing goals with ease.